The beauty of Samsung's Pay solution that made a debut with the Galaxy S6, is the fact that it will work anywhere magnetic stripe credit and debit cards are accepted, or more than 10 million points worldwide. Apple Pay requires merchants to equip their POS terminals with dedicated systems, that is why the uptake has been somewhat slow so far, but Samsung's decision to directly use LoopPay might quickly make it the most widely used mobile payment system. Even Google was put in a frenzy by the Samsung Pay speculation, forcing it to acquire Softcard in a jiffy. Now, a new report coming out of Korea, suggests that, unlike Apple, Samsung is waiving any fees associated with its fresh new mobile payment service. It won't charge the usual 0.0015% fee on each transaction, and that includes all of its credit/debit card partners in Korea, as well as online payment services. Samsung's heir recently met with one of PayPal's founders, so they might be getting tips on how to earn market share in the quickest possible way, with fee waivers being one of the driving force behind the Samsung Pay expansion. 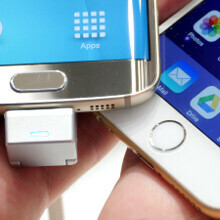 Whether or not this will translate into abandoning the fee structure for US credit card and other payment companies that will work with Samsung's solution on this side of the pond, it remains to be seen, but Samsung will have to battle Apple Pay here, so it might just as easily translate the free mobile payments offering to US customers as well. This would mean a lot on s6 sales.. It doesn't actually mean anything in terms of sales. People right now are not too bothered to go cardless, it is just a bonus. Those fee advantages will add a very minor amount to the number of people buying the S6/edge but it will bring more banks companies on board. Apple pay's real name is "iPay Apple"
"Even Google was put in a frenzy by the Samsung Pay speculation, forcing it to acquire Softcard in a jiffy." I'm curious how the author of this article knows this? because a few days to a week after samsung bought looppay google bought softcard. i will stop using wallet and switch to sampay easier to use over my wallet and mst is a real big bonus no more do you accept tap and pay or nfc most people dont know what that is. I'm sure you know the correlation does not mean causation. At best it's speculation on the author's part or an outright falsehood. In you and Samsung's wildest of imagination! Is Samsung capable of doing Anything original? Like first to use a curved edge display (and now dual curved edge display)? Or how about first to use UHS-3 Flash memory? And that's just to name a couple on their newest phone. Yes, like using your fingerprint sensor to log into websites that require password. Galaxy S6 now let's you do this by linking your fingerprint to websites requiring your password. You can not do this with Apple.